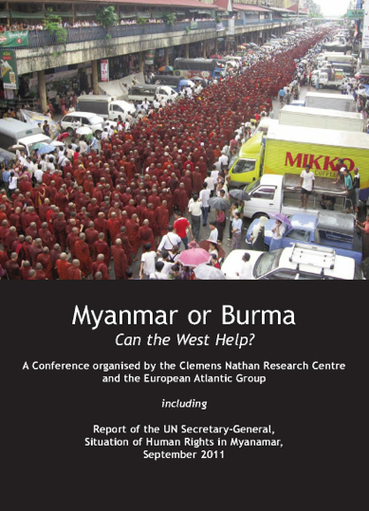 In 2009, the Clemens Nathan Research Centre organised, together with the European Atlantic Group, a conference held in the House of Commons Grand Committee Rooms on Myanmar or Burma: Can the West Help? This booklet includes the papers given at the event by Derek Tonkin (formerly HM Ambassador to Thailand and Laos, and Chairman of Network Myanamar). Stephen Thomas (representing the Parliamentary Democracy Party, Burma), Bo Aung Din (Chairman of the Parliamentary Democracy Party, Burma) and Clemens N Nathan. The papers are supplemented by the Report of the United Nations Secretary- General, Ban Ki-moon, on the Situation of Human Rights in Myanmar, September 2011.